Context: This action-research case study used a formative experiment methodological framework to examine how two adolescent boys with learning disabilities engaged with an iPad app to create and share their own digital stories. The boys were African immigrants with English as additional language and severe speech and communication difficulties. Case Report: Video observations of the key steps of the action research cycle and interviews with the boys’ teacher and teaching assistant were analysed using content analysis. Findings revealed that despite having some difficulties with learning some of the functions of the app, the boys were able to communicate their ideas to others, take ownership of the story by deciding on photographs and storylines and develop some social skills by presenting the stories to others in the class. Conclusion: Using the Our Story app was helpful in facilitating a sequential arrangement of the pictures and their annotation with sounds and short captions. Study findings are discussed in relation to using iPad apps with children with severe learning disabilities. Without a doubt, digital technologies play a growing role in the lives of young children, including children with learning and communication disabilities. Children with learning disabilities have historically been early adopters of technology, given that technology is often the only means facilitating these children’s communication and social interaction with others . Our previous findings and several other reports show that iPads and comparable tablets are part of the growing technology mediated communication of children in special education in Western countries. Unlike previous technologies which were often too loud, too big or too heavy for inclusion in standard SEN classroom, iPads do not embody these terms . Indeed, people with disabilities note that iPads may represent a shift in the “deficit discourse” , according to which mobile technologies can be used seamlessly and without disruption in everyday activities, including learning in the classroom. Thus, increasingly, educators are curious and keen to understand iPads’ learning potential and appropriateness for all students . The notion that iPads might be supportive of children’s learning involves an understanding of the specific characteristics of iPads and of the “apps”, that is programs which deliver specific content on the devices. iPads are touch-screens which means that they can record “the touch point of a finger or stylus” . iPads and similar digital tablets have replaced mouse and keyboard interaction with the direct possibility of touch or multi-touch to initiate a response from the device. This is a major advantage for children with physical disabilities, who often struggle with the mousebased manipulation of PCs and laptops. Unlike technologies of the previous decade, iPads are portable and light-weight, which facilitate their use in schools and in activities requiring portability (e.g., when taking photographs outdoors). Thanks to a variety of inbuilt technologies (e.g. camera, video, typewriter and microphone); iPads facilitate the production of various multimedia artefacts such as films, digital stories, texts and drawings. These assets are increasingly becoming an important means of interaction and expression for all young children . Software programs are available for iPads in the form of apps currently offered on the App store (approximately 80,000 for iPads alone). However, not all apps offered in the educational category truly support children’s learning, indeed “many so called educational apps lack design, instruction, content, and other vital features of high-quality educational software” . Conversely, emerging research shows that when the content of apps is selected and aligned with individual children’s needs, they can support children with disabilities to acquire or develop specific learning skills. For example, researchers  showed how an iPad-based video modelling package was used by a five-yearold boy with an autism spectrum disorder to teach him basic numeracy skills. In our previous study, we showed how the use of an iPad story-making app enabled a girl with complex language and communication difficulties to communicate her feelings to others in the classroom and school . In this study, we focus on a specific iPad app called “Our Story”. Our Story was developed by a group of educationalists and psychologists at the Open University in England in 2011 and is freely available as a public download on the iTunes and Googlemarket app stores. The app was used previously with children with complex needs  and has been shown to support parent-child engagement at home  and peer collaboration in the classroom . The design of Our Story harnesses the learning potential of story-sharing and story-creating by building on Vygotsky’s learning theory . This is reflected in the app’s filmstrip feature, which allows for a progressive use of more demanding skills within the child’s zone of proximal development , as well as the possibility for users to share created stories with selected audiences online, i.e. collaboratively developing knowledge through shared artefacts . The app is open-ended to encourage a child’s creativity but is also accompanied by some help pages, guiding the user through the app’s affordances. The design follows Vygotsky’s point that knowledge is co-constructed in dialogue with others or more specifically, between children and their parents/ teachers. Figure 1 shows the app’s opening screen. 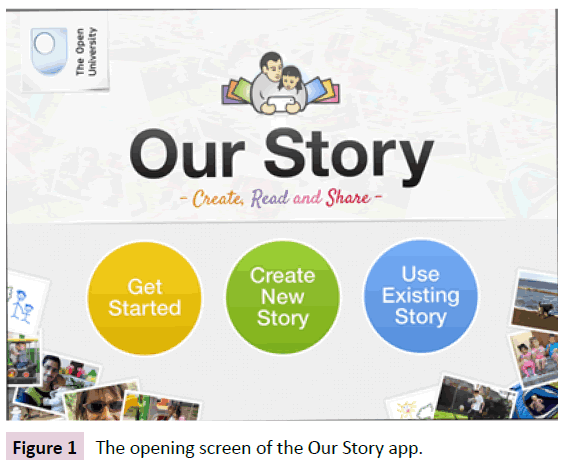 Figure 1: The opening screen of the Our Story app. Previous research into the use of Our Story has focused on nursery-aged and primary-aged children or older children with moderate learning difficulties [14,15,9]. This study aimed to complement this research and explore whether the app could be used successfully with two adolescent boys for whom English is an additional language (EAL) and who have severe learning disabilities, poor communication abilities (verbal and non-verbal) and difficult social behaviours, as described in detail below. The children in the study were assessed and identified as having severe learning difficulties (SLD) by the school, which means that their IQ score is below 50 ; that they are unlikely to be able to learn to read or write to any extent; and often have problems with the communication and understanding of language, possibly due to difficulties with deficits of working memory processes and the storage of information [17,18]. In addition, in common with 40-50% of teenagers diagnosed with severe learning difficulties , the boys had associated behaviour problems which require specialised services and coordinated care. There are a large number of programmes designed by speech and language therapists to enable children with SLD to improve their understanding of social communication, and to express their needs and desires . These might encompass Augmentative and Auxiliary Communication (AAC) aids for non-verbal children; a multi-modal approach of verbal and non-verbal therapies including sign language, for example, Makaton [21,22]; or assistive technology on iPads or other digital tablets . However, the functional vocabulary provided by speech therapists, teachers, or by the digital providers, may not be sufficiently individualised to each child in order for them to express themselves in any depth, especially taking into account their specific lifestyles and cultures . The Our Story app supports individualised (or personalised) support for children’s communication of ideas and we were therefore keen to see how its use, together with the easy and intuitive use of iPads  might support the communication abilities of two boys with severe learning disabilities. The study was framed as action-research, defined as ‘participative, grounded in experience, and action-oriented’ . Action research can employ a diverse range of study designs and methodologies  and we used the formative experiment methodological framework . Formative experiment aims to establish how a specific instruction-related design might support specific outcomes as well as the conceptual development of the actual intervention . Unlike traditional intervention research which often relies on “fix it approaches”, formative experiment is located in the perspective of multiple realities . Rather than the cause of change, the instrument of intervention (in this case the Our Story app), is conceptualised as “something that can be used, by the school as well as the researcher, to support changes” . Consequently, the research procedure integrates the pedagogical goal (i.e. the desired outcome) into to the process of the intervention  and uses the methodology of formative experiment as a way of investigating the instructional and intervention components of the study. Reflection is a fundamental element of the approach, as it serves as a connecting point between action and research . Reflection also helps the researchers understand about participants’ views and, in collaboration with the research participants, to “contemplate what can be learned from the experiences” . At the beginning of the study, a teacher in a local special school approached the authors with the idea of trialling the iPad app Our Story with two of his students in the classroom. The teacher (Mr P) thought that if the boys were given access to forms of digital technology that they could understand and use, they might improve their verbal and non-verbal communication and help them to express their ideas, and reduce their frustrations of not being able to communicate their ideas in the classroom. Thus the pedagogical goal in the study was to support two boys, who had extreme difficulties with communicating and expressing their ideas, using the Our Story app. The research question was: How can the Our Story app be used with pupils with severe learning and communication disabilities, to facilitate the expression and sharing of their ideas and support the development of their verbal and non-verbal communication abilities? The case study focuses on two boys (Jimmi and Aaron, both pseudonyms) who had come to England with their families from different African countries three years before the start of the case study. In addition to SLD, the two boys had the additional difficulties of communicating in a different language and living within a different culture . Jimmi was aged 16 at the time of the study. He was over 6ft 6ins tall and well-built with a slight coordination difficulty apparent in his legs when walking. He had SLD and associated social and cognitive learning difficulties, and has been identified as having an autistic spectrum disorder (ASD). Jimmi was observed to often chatter to himself in the classroom, either echolalic phrases or non-words or sounds, and communicated to others using one or two-word phrases and some functional Makaton signs , such as drink or food. He would typically respond to questions by repeating the last two words of the question, sometimes several times to process the information, before responding appropriately, or not at all. Jimmi had a short attention span, less than 2 minutes, and had to be repeatedly re-focused by staff when working on a task in the classroom. Aaron was aged 18 at the time of the study and similarly to Jimmi, was a very tall (6ft 2ins) and well-built boy, with generally good coordination. He was diagnosed with SLD and speech impairment (he was unable to clearly articulate words and only spoke in one or two-word phrases in English and with some basic Makaton signs). Aaron’s family spoke French at home but if members of staff speak to Aaron in French in the school, he would say ‘No French’ and would not answer. Aaron appeared to like others in the class apart from Jimmi, who he liked to annoy by making sounds or non-verbal gestures. Mr P taught the boys in the Post-16 class of seven pupils and four support staff, including Jenny, who worked with the boys in the study. He used the Our Story app with the class before the case study to present pictures of class trips and to familiarise the students with iPads. He thought that Aaron and Jimmi could be encouraged to use the Our Story app to communicate their own ideas and stories. The teacher’s strategy for using iPads with the boys could be described as “constructive”, which, according to researchers , is the most desirable strategy for using digital media with children with disabilities. Constructive use of technology involves accommodating, supporting and building on children’s and young people’s media activities (pg.193). It is the most difficult strategy to implement in a classroom as it requires a range of procedures for facilitating children’s engagement with digital technologies. Mr P was keen to support the boys’ spontaneous interests, introducing them to the various uses of iPads and negotiated with them the use of the device. Such a constructive orientation was reflected in the boys’ enjoyment and intrinsic motivation to use the devices. Mr P was supported by Jenny, a teaching assistant who was motivated to use new technologies, such as iPads, with the children in the classroom. Jenny was present at most of the researcher visits and has actively supported the two boys’ engagement with the app. The study took place in a special school in the South Midlands in the UK, catering for pupils (aged 2-19 years) with SLD; profound and multiple learning difficulties (PMLD); ASD and complex needs. The majority of the pupils also had communication difficulties due to their learning difficulties or to articulation problems; and some had physical difficulties ranging from dyspraxia to severe cerebral palsy, and used wheelchairs for mobility. The school had a wide range of specialist facilities including a multisensory interactive learning environment, Optimusic Room, soft play room, dark room, a hydrotherapy pool with sensory equipment and a range of therapy rooms. All the classrooms contained large touchscreens and iPads, and all the teachers had their own iPads for photographing and recording the pupils’ activities and progress. • A visit to conduct post-study interviews and check the boys’ ongoing use of the app and observe any sustained improvements in their communication abilities. The study was designed as a series of action research cycles in order to be able to assess and reflect on each cycle and evaluate the outcomes with Mr P and Jenny at each stage. The researcher (first author of this paper) collected data by observing how the two boys, Mr P and Jenny used the app in the classroom, by videorecording the key interactions, taking field notes and recording interviews with Mr P and Jenny, using an interview protocol developed in discussion with the second author of the study. The video and observational data (in the form of field notes) were analysed by both researchers, with main themes captured in the description of individual tasks of the research cycle. The interview data were transcribed and analysed using content analysis and the development of emerging themes [36,37]. Both Mr P and Jenny were sent the transcripts for their approval and amendment, if necessary. The study was approved by the Open University Ethics Committee and followed the British Educational Research Association's ethical guidelines for educational research  which advises that participants are treated “within an ethic of respect”. As the boys had severe learning difficulties, appropriate informed consent was given by the boys’ families after discussions with Mr P who visited both families prior to the study. Pseudonyms were used to protect participant identity. Consideration was given that the boys did not get fatigued by the sessions, and photography and filming was stopped if the boys appeared disturbed or uncomfortable. 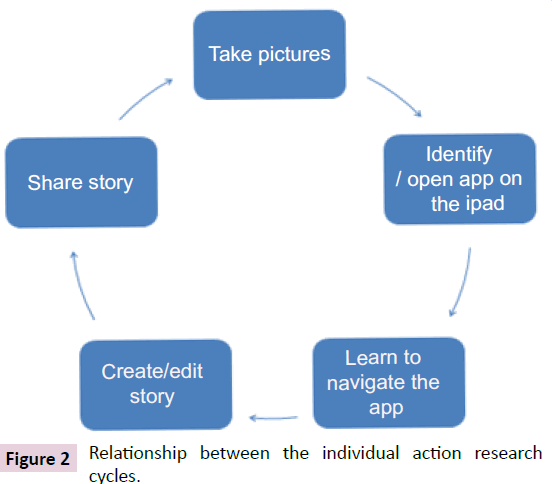 There were five action research cycles, developed to enable the students to take photographs of their own interests; to teach them how to use the app to communicate ideas for the story; take ownership of the story by deciding on photographs and dialogue and develop social skills by presenting the stories to others in the class/ parents and carers. The content and nature of each cycle were decided in conversation with Mr P, the teacher assistant Jenny and the authors of this paper. The individual cycles fed into each other sequentially, and each cycle enriched the previous cycles. Figure 2 illustrates the relationship between the individual cycles. Figure 2: Relationship between the individual action research cycles. Details of the aims, the teacher’s, teaching assistant’s and boys’ actions and the researcher’s evaluation are included in Table 1. The column entitled Staff support included Mr P’s and Jenny’s actions and description of individual steps; and the column Researchers’ Evaluations are based on video and insitu observations. Photographs of both of the boys and their engagement in the individual tasks are shown in Figure 3, to further illustrate the process of learning. Table 1: Performance (z-scores) of the four cases of DD and mean performance (SD) of the norm groups on Raven’s, reading and arithmetic. Table 2: Performance (z-scores) of the four cases of DD on general cognitive processing, number processing, time processing and spatial processing. 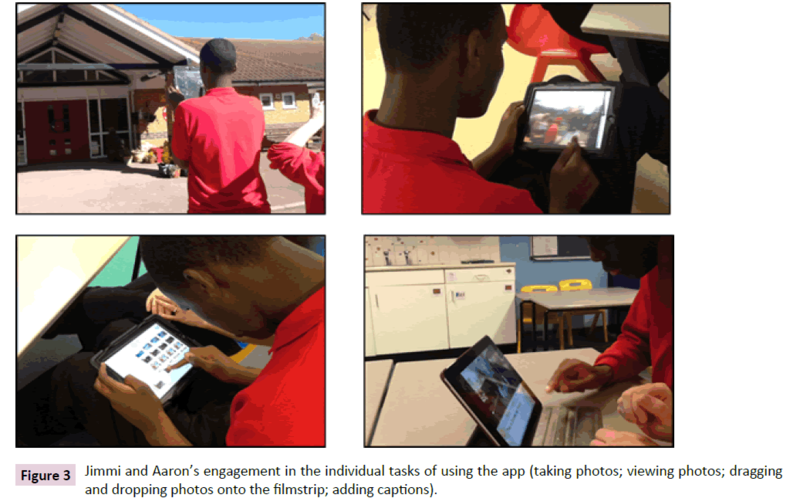 Figure 3: Jimmi and Aaron’s engagement in the individual tasks of using the app (taking photos; viewing photos; dragging and dropping photos onto the filmstrip; adding captions). Interviews with Mr P and Jenny explored their reflections on the individual action research cycles and the progress made by the boys in terms of their communication skills and ability to express and share their ideas (story) with others. Content analysis of the transcribed interviews identified three key categories concerning the strengths and difficulties of using Our Story with the boys: enjoyment of using the app; communication of the story; and technological dexterity. The teacher commented on how much the two boys enjoyed using the iPads to take photographs and access the app and were motivated to work for long periods of time (up to thirty minutes). Because of their interest in the tasks, both boys worked and were engaged for much longer than in their usual class work, and both looked through their photographs and stories at other times, including school trips. Mr P reported: “Once the boys were shown what to do, they enjoyed looking at their pictures and scrolling through them to decide which to put on their storylines.” Although both boys only offered one or two word captions, either the name of the person or the place, they loved the activity of taking pictures and being free to choose the location and content for their own pictures. Mr P was very pleased with the benefits of using the app especially for Jimmi’s communication skills. He said that after using the app, Jimmi uses his ‘ability for recall to improve his sentence structure, and is starting to initiate conversation”. The Discussion focuses on the main themes which emerged in the post-study interviews and their relationship to wider issues concerning technology-mediated support of communication of children with severe learning and communication disabilities. In our study, two boys with communication and learning disabilities and English as additional language enjoyed working with the Our Story app, mostly because of the possibility to use pictures and short audio-recordings to express their ideas. The boys’ limited language skills meant that they were unable to independently form simple sentences and use them as captions for their photographs. The teaching assistant, Jenny, added short captions to the boys’ stories using their own ideas, although we can be never sure whether these truly expressed the boys’ thoughts and feelings . The juxtaposition of pictures and text may have enabled the boys to comprehend and transfer their learning, an outcome previously noticed with technologymediated communication . Our observations and the staff’s accounts revealed that while Aaron was confident about reading his story to others, and enjoyed their feedback, Jimmi read the story to himself and Jenny rather than to others. This may be a reflection of Jimmi having an autistic spectrum disorder in that he does not always respond to the needs of others . Children with ASD often develop their imaginations through the teaching of literacy when they are encouraged to write poetry and stories. For the boys in our study the possibility to take pictures and communicate their story ideas in a picture format was a valuable alternative to having to verbalise or write their ideas [41,39]. With reference to the boys’ limited technological dexterity and Our Story, it is clear that the boys’ inability to read, and possibly, understand the icons on the screens affected their ability to navigate the app and work independently. However, both boys have learnt new skills since using the app, such as reading their own names, identifying their teachers’ names and finding folders on the screen which they were unable to do before. This was not an anticipated outcome of the study as many children with SLD cannot learn conventional literacy or digital literacy skills [42,20,43]. Further use of the app may result in the boys gaining a more explicit understanding of the functions of the icons, and develop their technological dexterity [44,1]. Action research is a suitable approach given that it is oriented towards improvement and that it invites research participants (in our case the teacher and teaching assistant) into the research process. However, the results of an action research study cannot be generalised, they can be only used to identify whether further study is likely to be fruitful . Although the study may offer a useful guide to assist other special needs educators and its findings might be applicable to other contexts with similar participants, it should be borne in mind that this study focused on two particular boys with specific language and communication disabilities, and the study findings are specific to them and the particular study context. Since the development of digital tablets such as iPads and the production of educational apps, teachers in special schools are engaged in creating and developing new forms of supporting children’s communication and expression of ideas [41,39,6]. This study has shown that adolescents with SLD, EAL and communication difficulties are able to learn the functions of an app in order to express their thoughts and to create simple stories. We note, however, that the teacher’s and teaching assistant’s support throughout the process was essential in ensuring the success of the intervention. The boys were not always able to identify, or understand the functions of some of the icons and without support could become frustrated, which would invalidate the whole purpose of sharing their ideas. It is therefore essential that if teachers use iPads with children with SLD, teachers are present and able to help children if there are problems with navigating through the functions. Although the use of iPads may appear intuitive to some students , when it comes to using individual apps, this is often not the case and children need the support of adults . It should be also borne in mind that while in our study, the teacher and teaching assistant were both IT-savvy and keen to use iPad apps in the classroom, this is not typical of all teachers who have access to technology . We provided some basic training and demonstrated the use of the app at the beginning of the study, but more extended training sessions may be needed in educational contexts where the use of iPads is not common or where teachers feel less at ease with new technologies. Based on our findings, we also recommend that educators interested in using iPad apps such as Our Story with children with SLD identify the individual stages involved in its use and proceed through these on a step-by-step basis. This can reduce children’s anxieties around the difficulties involved in the complex process of creating digital stories and communicating these to others. When it comes to expressing their ideas, children with limited language feel most comfortable with pictures , especially those they can take themselves. For children for whom English is not their first language, we therefore recommend the use of pictures in the first step of a learning cycle. In conclusion, digital technology can be used to enhance the teaching and learning of all children, including those with disabilities . Utilising an action research study format enabled us to document, and includes the staff’s reflections of, the process of supporting two adolescent boys with severe language and communication disabilities in using a story-making iPad app. The strengths and limitations of this approach may be of interest to other researchers examining the use of iPads apps with children with special educational needs, especially those with profound communication disabilities. For Mr P and Jenny, this case study was an invaluable opportunity to evaluate the potential they saw in iPad apps and, for the two boys, the study was an important experience which enabled them to share their ideas and own stories. Ayres K, Mechling L, Sansoti F (2013) The use of modern technologies to assist with life skills/ independence of students with moderate/ severe intellectual disability and/ or autism spectrum disorders: considerations for the future of school psychology. Psychol Schools 50:259-271. Chai Z, Vail CO, Ayres KM (2014) Using an ipad application to promote early literacy development in young children with disabilities. J Spec Educ. Whitburn B (2013)The indelible ink of the special stamp: An insider’s research essay on imprints and erasures. DisabilSoc 29: 624-637. Laidlaw L, O’Mara J, Wong S. “Daddy, Look At the Video I Made on My iPad!” Reconceptualizing “Readiness” in the Digital Age, Rethinking Readiness in Early Childhood. Education: Implications for Policy and Practice, 2015. Hamza Z (2014) Study of Touch Gesture Performance by Four and Five Year-Old Children: Point-and-Touch, Drag-and-Drop, Zoom-in and Zoom-out, and Rotate.Theses, Dissertations, and Other Capstone Projects.Paper 354. Flewitt R. Multimodal literacies. Desirable literacies: Approaches to language and literacy in the early years. 2008; 122-139. More C M, Travers JC (2012) What’s app with that? Selecting educational apps for young children with disabilities.Young Exceptional Children. Jowett E L, Moore D W, Anderson A (2012) Using an iPad-based video modelling package to teach numeracy skills to a child with an autism spectrum disorder. Developmental Neurorehabilitation 15:304-312. Kucirkova N, Messer D, Critten V, Harwood J (2014) Story-Making on the iPad When Children Have Complex Needs Two Case Studies. Communication Disorders Quarterly 36: 44-54. Kucirkova N, Messer D, Sheehy K, Flewitt R (2014) Sharing personalised stories on iPads: a close look at one parent–child interaction. Literacy 47: 115-122. Vygotsky LS (1964) Thought and language. Ann Dyslexia14:97-98. Vygotsky L (1978) Interaction between learning and development. Readings on the development of children 23:34-41. Pappert S, Mindstorms.Children, Computers and Powerful Ideas. Paris, France: Harvester Press, 1980. Kucirkova N, Messer D, Sheehy K (2014) Reading personalized books with preschool children enhances their word acquisition. First Language 34: 227-243. Kucirkova N. iPads in early education: separating assumptions and evidence. Front. Psychol 5:715. Hulme C,Snowling M. Developmental Disorders of Language, Learning and Cognition. Chichester: Wiley-Blackwell, 2009. Pickering S, Gathercole S (2004) Distinctive working memory profiles in children with special educational needs. EducPsychol-Uk24:393-408. Henry L. The Development of Working Memory in Children. London: Sage 2012. McCarthy J (2005) Teenagers with severe learning difficulties and behavioural problems: what to do. Current Paediatrics 15:127-132. Feiler A, Watson D (2010) Involving children with learning and communication difficulties: the perspectives of teachers, speech and language therapists and teaching assistants.Br J Learn Disabil39:113-120. Sheehy K, Duffy H (2009) Attitudes to Makaton in the ages on integration and inclusion in International Journal of Special Education 24:91-102. Shah N (2011) Special Education Pupils Find Learning Tool in iPad Applications. Education week 30:1-16. Cargo M, Mercer SL (2008)The value and challenges of participatory research: Strengthening its practice. Annu Rev Publ Health 29:325-350. Reinking D(2004) Bradley B A. Connecting research and practice using formative and design experiments. Literacy research methodologies 149-169. Tracy K N, Headley K N (2013) I never liked to read or write: A formative experiment on the use of a nonfiction-focused writing workshop in a fourth grade classroom. Literacy Research and Instruction 52:173-191. Labbo L Reinking D (1999) Negotiating the multiple realities of technology in literacy research and instruction. Read Res Quart 34:478-492. Newman D (1990) Opportunities for research on the organizational impact of school computers. Educational Researcher 19:8-13. Calais G J (2007) Bridging the gap between literacy research and instructional practice via formative experiments. National Forum of Teacher Education Journal 17:1-5. Coughlan P, Coghlan D (2002) Action research for operations management. Int J Oper Prod Man22:220–240. Lau F. A review on the use of action research in information systems studies. In: A. Lee, J. Liebenau, & J.I. DeGross (Eds.) Information systems and qualitative research 1997; Chapman & Hall: London. Cooley E, Triemer D (2002) Classroom behaviour and the ability to decode nonverbal cues in boys with severe emotional disturbance. The Journal of Social Psychology 142:741-751. Grove N, Walker M (1990) The Makaton Vocabulary: Using manual signs and graphic symbols to develop interpersonal communication. Augment AlternCommun 6:15-28. Durkin K, Conti-Ramsden G (2014) Turn off or tune in? What advice can SLTs, educational psychologists and teachers provide about uses of new media and children with language impairments? Child Language Teaching and Therapy 30:187-205. Holsti OR. Content Analysis for the Social Sciences and Humanities. Addison-Welsley, Reading: MA, 1969. Neuendorf K A. The content analysis guidebook. London: Sage. 2002. BERA-British Education Research Association. Ethical Guidelines for Educational Research. London: British Education Research Association, 2011. Lacey P, Layton L,Miller C, Goldbart, J, Lawson H (2007) What is literacy for students with severe learning difficulties? Exploring conventional and inclusive literacy. Journal of Research in Special Educational Needs. 7:149-60. Frith U. Autism and Asperger Syndrome. Cambridge: Cambridge University Press, 1991. Aird R (2000) The Baginton-in-the-fields English Scheme. Br J Spec Educ 27:171-175. Hobson RP. Autism and the Development of Mind.Hove: Psychology Press, 1993. Woodard C, Van Reet J(2011) Object identification and imagination: An alternative to the meta-representational explanation of autism.J Autism Dev Disord 41:213-226. Karmilov-Smith A. Beyond Modularity A Developmental Perspective on Cognitive Science. Massachusetts: Massachusetts Institute of Technology, 1992. Geist E (2011) The game changer: Using iPads in college teacher education classes. Coll Stud J 45:758. Falloon G (2013) Young students using iPads: App design and content influences on their learning pathways. ComputEduc 68: 505-521. Nordkvelle YT, Olson J (2005) Visions for ICT, ethics and the practice of teachers. Education and Information Technologies 10:21-32. Xu Y (2006) Toddlers’ emotional reactions to separation from their primary caregivers: successful home–school transition. Early Child Dev. Care 176:661-674.